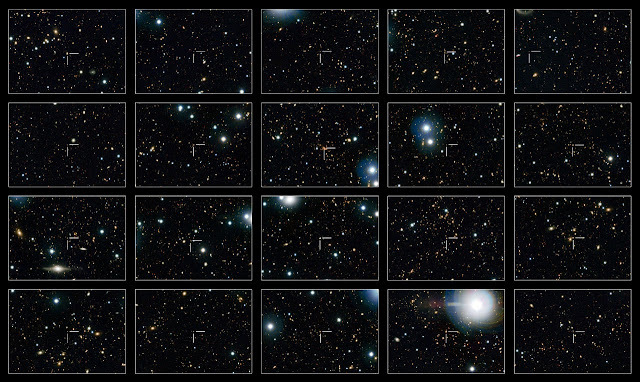 Image shows 20 galaxies that are no logner forming stars. Called Quenched galaxies, these have been imaged by the Hubble Cosmos Survey and can be identified by the crosshair at the center of each image. Astronomers have recently discovered why quenched galaxies seem to be growing despite the fact that it doesn't produce stars anymore. The previous theory for the supposed growth of quenched galaxies was that these small galaxies have merged with other smaller galaxies. By using the Hubble COSMOS observations, astronomers have found that larger galaxies switch off (stop forming new stars) at later times which gives the impression that previous quenched galaxies have grown over a duration of time.